Much to my surprise, and disgust,the John Birch Society still exists. It's members have been dwelling under rocks waiting impatiently for a chance to re-emerge and spread their message of hate to a new generation. In my day, back in the 50s and 60s, The John Birch Society took advantage of the Cold War to spread hate under the guise of patriotism. 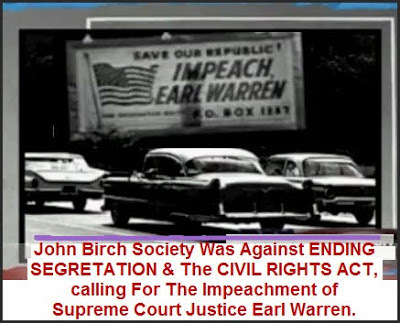 In the last few years the John Birch Society has experienced a resurrection in Texas, the new epicenter for the group. Gone is the organization’s past obsession with ending the supposed communist plots to achieve mind-control through water fluoridation. What remains is a hodgepodge of isolationist, religious and right-wing goals that vary from concrete to abstract, from legitimate to conspiracy minded—goals that don’t look so different from the ideology coming out of the White House. The John Birch Society once thrived pushing the idea of Soviet infiltration in the U.S. government. Now, it wants to stop the investigation into Russia's 2016 election meddling and possible collusion with Trump's campaign. Once considered a group of extreme loonies, the Birchers have found a new supporter in Trump, and his wacky administration. Even the Republican Party, once considered mortal enemies of the Birchers, are now considered an ally. How times change. Texas Gov. Abbott distrusts the federal government. Period. He's the same clown that when serving as a Texas attorney general, filed numerous frivolous lawsuits against the Obama administration. But, Gov. Abbott, is really famous for a stunt that thrilled the Birchers back in 2015. Some Texans feared that a U.S. military training exercise called “Jade Helm 15” was a covert attempt by the federal government to invade the state, seize Texans’ guns, and imprison conservative citizens in abandoned Wal-Marts, Abbott deployed the Texas State Guard to monitor the U.S. military. A Bircher-friendly move if I ever saw one. It's no wonder the John Birch Society is so optimistic these days, they have an ally in Texas, and the White House.